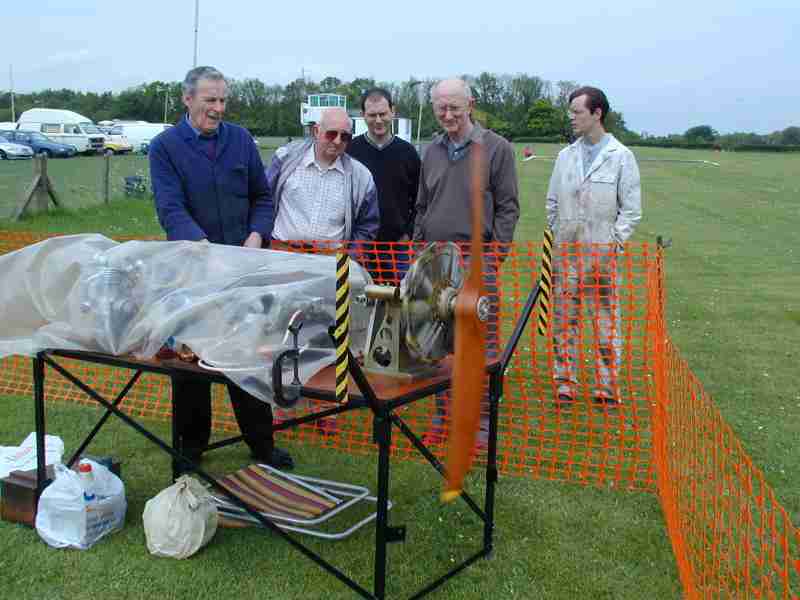 UK aeromodellers have had a hard time this (northern) flying season due to the Hoof and Mouth outbreak. The way this disease seeps into the soil and the ease with which it can be transported by mud on boots has resulted in a simple closing down of beloved and precious flying sites. Even the annual gathering at Old Warden seemed out of the question. 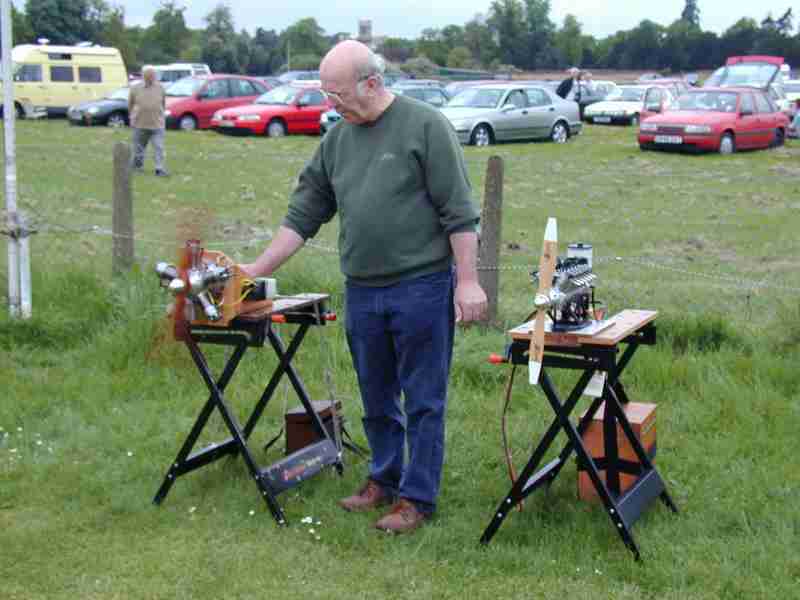 Fortunately, the restrictions have been relaxed enough to allow the event to go ahead and as usual, Ken Croft was there displaying and running his engines and capturing photons. I have just returned from two days of glorious summer sun at Old Warden for the Vintage and Electric weekend. A funny combination that is! I can see no connection between a high speed delta with a screaming 1 hp electric motor making as much din as an ic engine, and a vintage cabin model. Ah well, it takes all sorts I suppose. 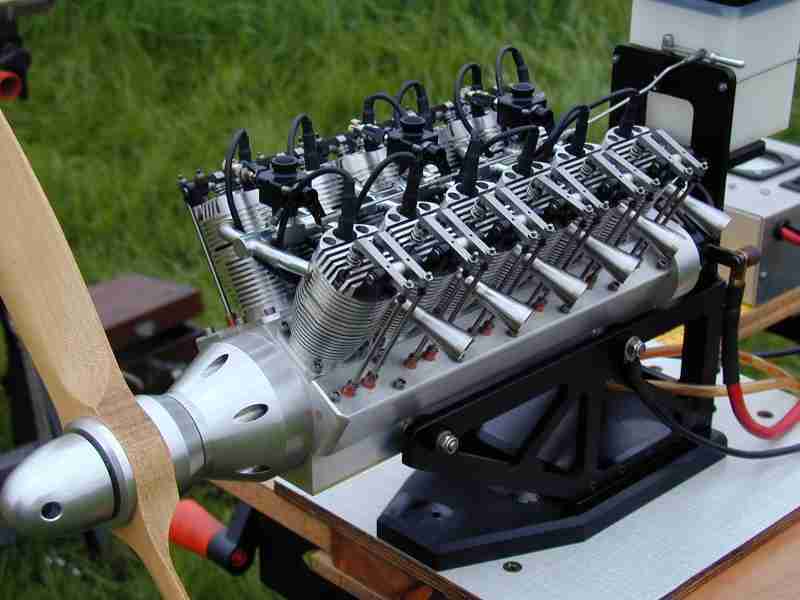 Some of the engines in the pictures I have attached have been seen before, in particular the V12. But these are better pictures. Some words of explanation. 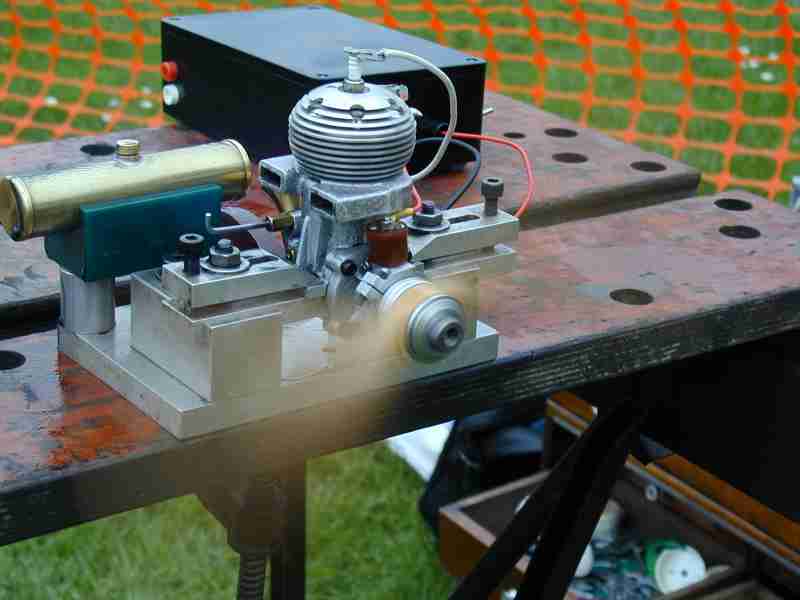 The V12 and the Kinner Radial are by Ron Hankins. The Rotary Bentley, the Lee Hodgson Radial, the AJS 7R and the Flat Twin that can just be seen perhaps, are by Bill Connor. 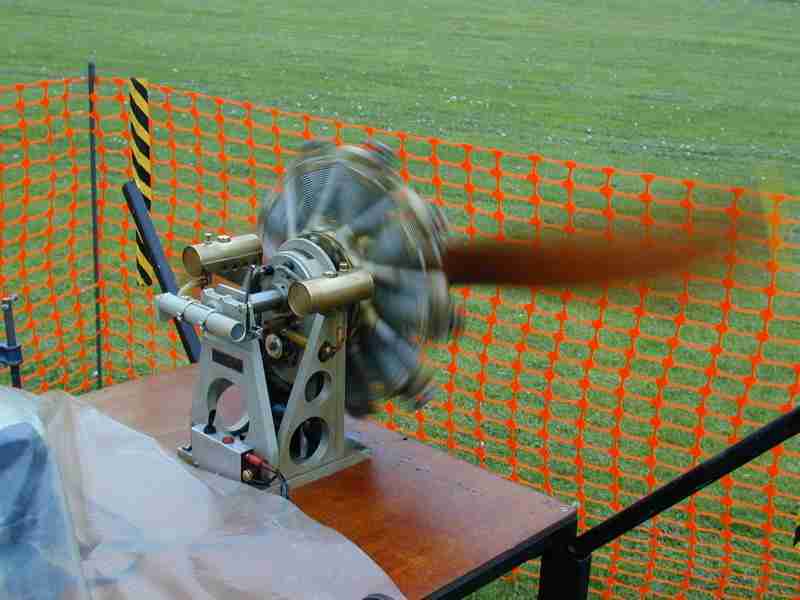 The Bentley has nine cylinders, 800cc capacity, and swings a 48" prop at 1200 rpm, and does it move some air! Sadly it seized one piston, and the resulting inertia grabbed the static crankshaft, sheared the locating pins and rotated the shaft 180 degees. Back the the workshop sadly. The real star for me was the sound of the AJS 7R motor bike engine. This is 40cc and has a working megaphone exhaust. 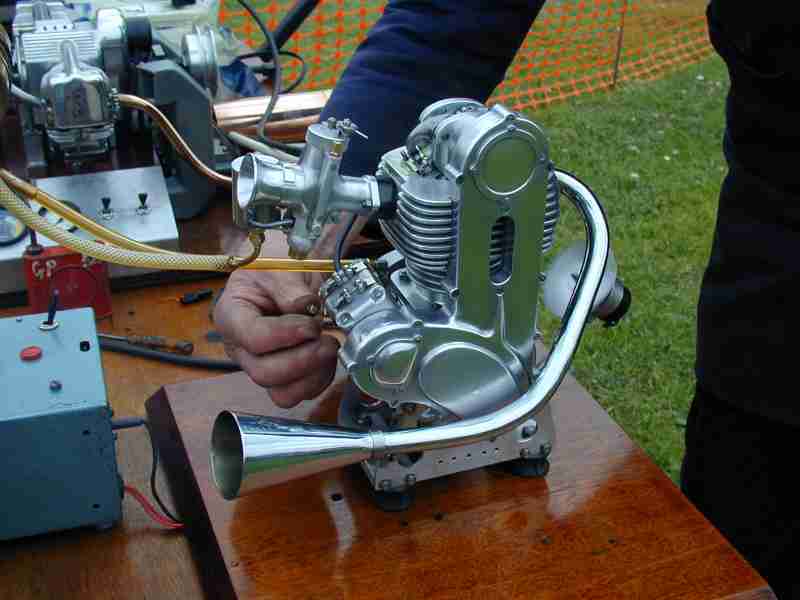 For those who are not into such things, the AJS 7R was a famous racing bike engine. 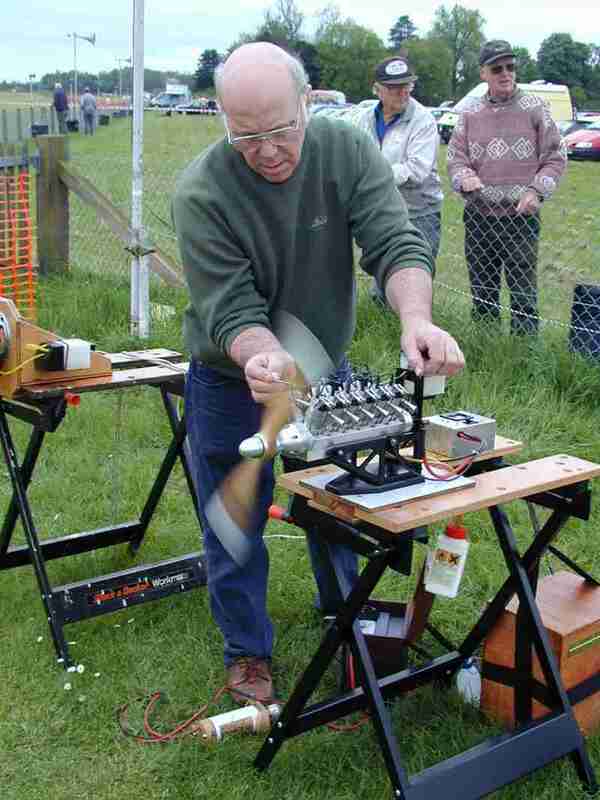 He had built 3 sets of cams to get the sound just like the real thing. The mega really worked, and the sound on the everun with 100 degrees of valve overlap was absolutely the best sound I have ever heard a model engine make. If you know how a racing single sounds with that oooooooooooooo-aagghh sound, you will know what I mean. Absolutely glorious! 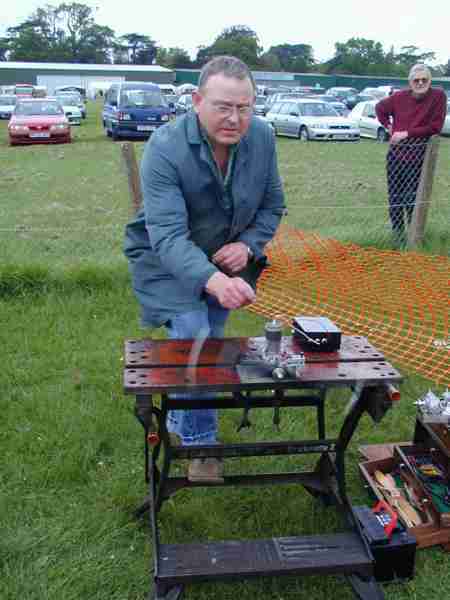 Some of you will have heard of Eric Offen, one piccy shows him with his Felgeibel running, an early 15cc German petrol engine, and the Cave Cobra is also Eric's. On my engine running set-up [no pictures] I had a board saying which engine I was running, and an advert for The Book, with some stickers to hand out about how to buy it, and saying what the Motor Boys group is all about. About half a dozen people showed some interest, so a few sales might result. 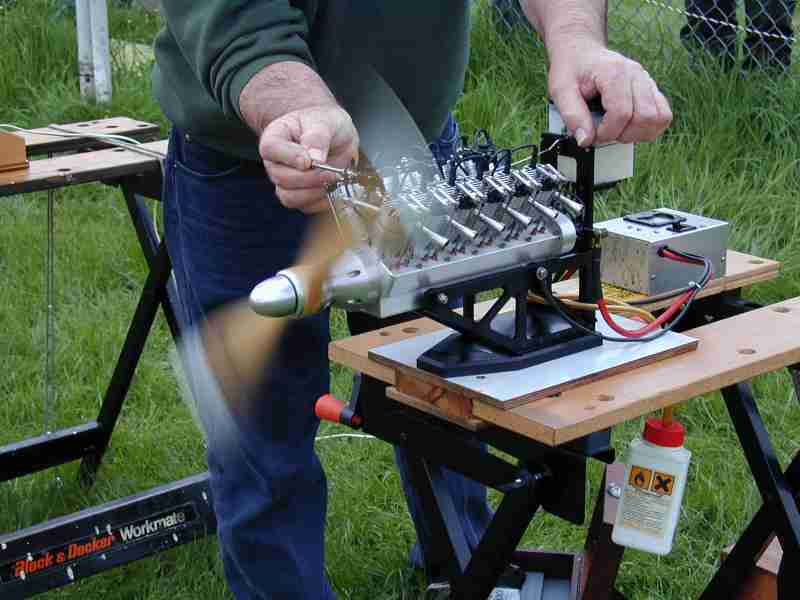 I ran diesels on the bench, but flew my Flying Midget re-engined with my Rogers and Geary Hornet 3.5cc petrol engine [copy], and my Mercury Bullet with the Belmont Gnat, each afternoon. On the bench I had a Mate, Thaler, Nova, Suzer Etheromaine, Delong, Sparey Twin and Weaver. The one that generated most intrest was the Nova. Everybody enjoyed the long lanky period look of it, and the lazy 4500 rpm on a big 14x6. Finally to round off the day I had a couple of good control line flights with Mike Beach's Skeeter, powered by a Drone diesel. We finally fixed it with a soft 30 thou aluminium head gasket and socket screws to hold the head down, and it goes like the clappers on standard diesel fuel! See picture of Mike and model. Final final comment. If the big rotary, the 7R, the Hodgson radial and the flat twin are not enough, the same guy has borrowed a vintage Austin 7 full size car. 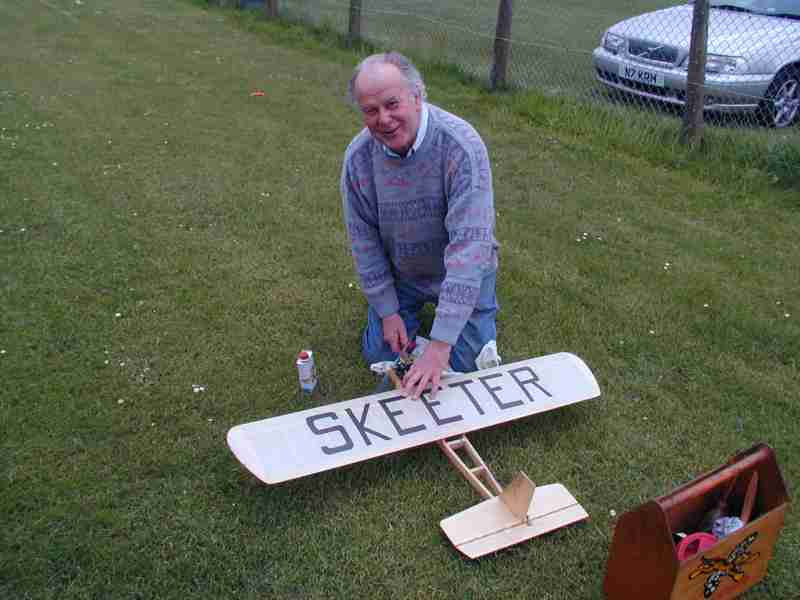 He has completely stripped it, measured it, and is making a true 1/4 scale replica! It is about 3/4 built so far. I can't resist a footnote, Hodgsons being a bit of a current passion of mine: the Hodgson radial above is the same engine that appeared on the back of SIC recently. What makes it special is the deviations from the drawings where the builder has added rocker and push rod covers. The exhaust system (not really visible in Ken's shot) is also a work of art. The Hodgson design began life as a four page article with two pages of drawings in Popular Aviation magazine from 1936 (these pages also appeared in Engine Collectors' Journal some years back which is still available in back issue form). Sam Hodgson built one from these plans, then added drawings to depict missing parts and add tooling etc. Sam, and later, his son Lee, went on to produce drawings for 5 and 7 cylinder, single bank radials, plus 14 and 18 cylinder, dual bank engines. 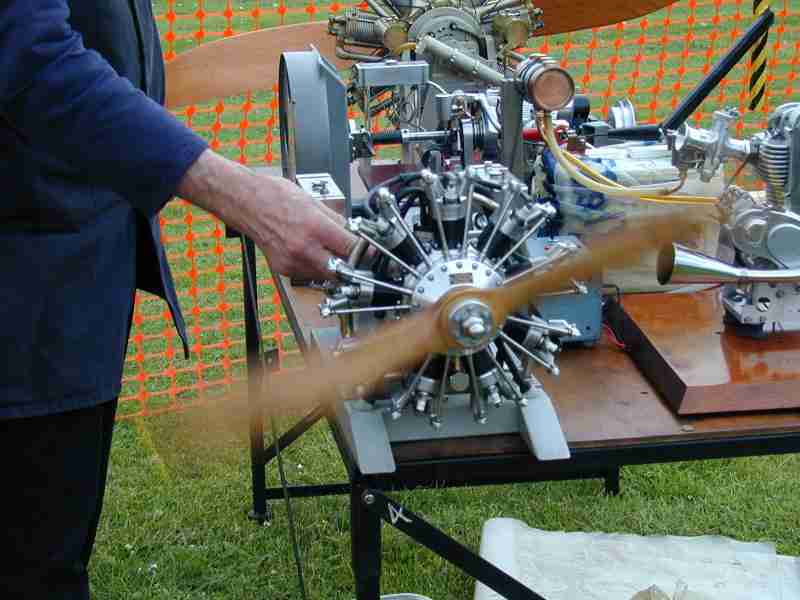 Other designs from the Hodgsons include a large, 1/4 scale Bentley BR2 rotary (like the one shown running above) adapted from Australian Lew Blackmore's design. Over the years this plan set expanded with more fixtures and job sheets, eventually being converted to a set of CAD drawings by Lee. Currently, the 9 cylinder design that was shown in 2 pages of drawings in Popular Flying comprises a total of 128 sheets! 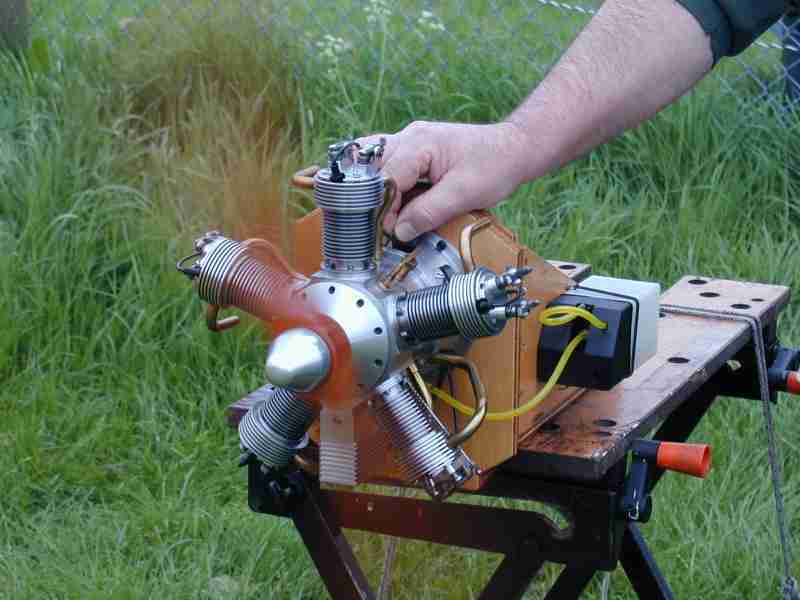 Outwardly, the design is still the 1936 Popular Aviation engine. Now beauty is in the eye of the beholder and even that changes over time, but I think the PA looks unlike any "real" radial due to the parallel sided, finned extensions that enclose the valves. According to the SIC back cover, Bill Connor modified the appearence to more closely resemble a 1930's vintage radial with a "Pratt and Whitney-ish" flavor (though it looks more "Wright-ish" to me). IMHO, this improves the appearence of the engine out of sight -- In Russell Watson-Will's words, it makes it "..look like an engine!" (both Russ and I have Hodgson drawings and castings "under the bench" for a rainy day). 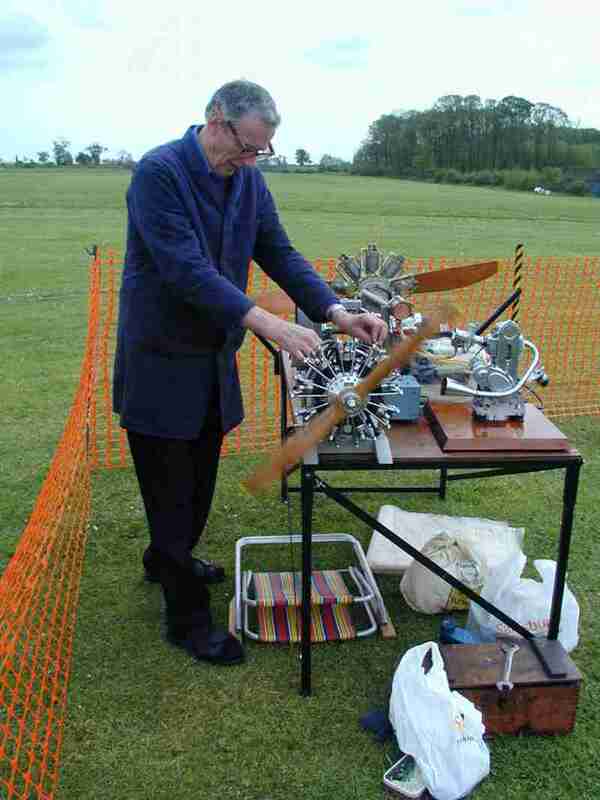 I encourage you to visit Lee's Ageless Engines web site for the full story. Lee advertises frequently in SIC showing a picture of the 9 and 18 cylinder designs. Eagle-eyed readers will note that the 18 also sports rocker covers, though the 9's rockers remains exposed. In an email, Lee informed me that the plans for the dual row radials show covers, while the single bank engines retain the original exposed design. Another site to visit when looking at what can be done with this design is 5 Bears Engineering (he's gotta be Canadian). Kurt Bjorn also added exquisite rocker and push rod covers and gives prospective Hodgson builders some insight into the gotcha's he experienced.